Almost everyone has a story about the time (usually in their younger days) when they did too many tequila shots and swore they’d never drink the stuff again. Most seem to return to tequila later, albeit likely in smaller quantities of higher quality tequila. Most people, if they’ve heard of mezcal at all, think of it as bad tequila. The reputation comes because inexpensive mezcal often includes a worm at the bottom of the bottle, a marketing gimmick designed, one can only imagine, to attract frat boys on spring break in Mexico who prove their toughness by drinking poor quality mezcal. But mezcal need not be harsh, cheap, or gimmicky, and Wahaka Mezcal is proof. Mezcal, for the uninitiated, is similar to tequila. Actually, technically all tequila is mezcal, but all mescal is not tequila. This is because mezcal can be made with any type of agave while tequila must use the blue agave variety. Also, mezcal is known for it’s smokier flavor, because the agave is roasted while tequila is always steamed. Wahaka Mezcal Joven Espadin, which I picked up for $45 (though it can be had for around $30), is made using traditional means using 100% organic mezcal grown Oaxacao, the center of mezcal production. “Joven Espadin” distinguishes this variety from the other varieties produced by Wahaka. According to a label included with the bottle, after 10 years in the ground the agave is harvested (this batch was harvested in spring 2011), milled using millstone turned by a donkey, cooked and smoked 3-5 days, fermented 12 days, then distilled twice in copper stills. The resulting spirit has an inviting nose that’s sweet and floral with a hint of smokiness and pine. The taste is clean, with just a bit of sweetness, light smoke, pepper, salt, and butter. The finish is smooth and fleeting. 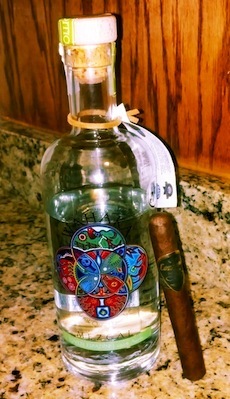 Despite the harsh reputation of mezcal, Wahaka is a mild spirit that needs a mild or medium-bodied cigar as a pairing. The medium-bodied CAO Concert (pictured), while an excellent cigar, was as full-bodied a cigar as a I would want. A milder cigar like the Oliva Connecticut or a Davidoff Mille series would be an even better pairing. While Wahaka isn’t as smoky as most mezcal I’ve tried, it makes an excellent introduction to mezcal while being plenty interesting for the more seasoned drinker. If you’re interested in branching out beyond the worm, it’s well worth trying. While we all should be open to try new things, there are some that are just plain not worth our while. I don´t mean to disrespect Mezcal, its producers or its roots. But with so many aged spirits in the market (rum, brandy, single malt, bourbon, etc), I would think we all could spend our time trying other, more sophisticated drinks (even beers or wines). For example. I tried some High Quality Tequilas on a recent trip to Cancún (México) and found a new love for the drink, I did not have. However, alcohol like Mezcal, Aguardiente (my excuses to Colombians), among others; are better left for occasions when you cannot find any other drink. Awesome. Love the mezcal write up! Something different.